Family-freely new generation SD Gundam, finally starting! ! 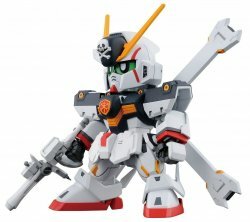 "Crossbone · Gundam X - 1" line up from "Mobile Suit Warrior Crossbone · Gundam". Distinctive X binder is reproduced i.. Distinctive X binder is reproduced independently. Pupils can be reproduced with replacement. [Adopt crossed silhouette system! ! ? Various head-body can be reproduced by SD (super deformed) frame and CS (cross silhouette) frame which are internal frames. It is also possible to combine your favorite proportions by combining "Cross Silhouette Frame" sold separately.